Studio Line: Warner Bros. - What Can Two Men Do Against A Gang Of Crooked Cops? Whatever It Takes. A Detroit detective whose off-kilter heroics get him busted to the city's worst precinct, teams with a street-smart hustler to battler corrupt cops. A fast, bold blend of hip-hop style and chop-till-you-drop action! Box Office: Budget: $33 million. Opening Weekend: $18.485 million (2830 screens). Domestic Gross: $51.758 million. DVD: Widescreen 2.35:1/16x9; audio English Dolby Digital 5.1, French Dolby Digital 5.1; subtitles English, French, Spanish, Portuguese; closed-captioned; single sided - dual layered; 32 chapters; rated R; 101 min. ; $24.98; 8/31/01. Supplements: “The Making of Exit Wounds”; DMX “No Sunshine” Music Video; “A Day On the Set With Anthony Anderson”; Trailer; Cast and Filmmakers. When Steven Seagal disappeared from movie screens a few years back, no one sent out a search party. Actually, I suspect that some fans missed him, but I didn’t fall into that category. He always resided on that second tier of action heroes behind big names like Schwarzenegger, and few of those actors did much for me. Van Damme, Norris, and Seagal all seemed very one-dimensional, and their movies rarely offered much to make them stand out from the crowd. Seagal’s 1992 hit Under Siege was a decent flick, but otherwise his résumé was filled with predictable duds. To the surprise of many - including me - Seagal returned semi-triumphantly to multiplexes in early 2001 with Exit Wounds. This flick actually hit the number one spot during its opening weekend with a gross of $18 million. Eventually it snared $51 million; that wasn’t a terrific take, but it seemed more than acceptable for an aging, tubby action star. Frankly, I can’t explain the modest success of the movie. Conventional wisdom opines that Wounds capitalized on the starring role of popular rapper DMX, but many of his peers have appeared in flicks without such prosperous results, so that doesn’t seem to tell us much. Perhaps the Seagal faithful are more numerous than we’d expect and they took over briefly. All I do know is that Wounds offers a serious case of the same old thing. Seagal plays Orin Boyd, a rogue cop ala Harry Callahan who finally cheeses off too many people when he embarrasses the Vice President. This was plot stretch number one, and it immediately set me against the film. Boyd performed heroically and single-handedly saved the Veep from a serious roster of nasties, but all anyone seemed to notice was that he had to throw the dignitary into the river to rescue him. Logically Boyd would have been mightily honored for his efforts, but the movie needed to knock him down a peg, and this was the method it used. 1997’s Con Air started with a similarly off-putting lack of logic, and both instances really made it hard for me to get into the films. In any case, Wounds continues as Boyd is shifted to the troubled 15th Precinct in Detroit where he still annoys people. Eventually he’s reduced to traffic cop, but he proceeds to pursue a lead that relates to mysterious Latrell Walker (DMX), an apparently evil dude. In this world, nothing is what it seems, and Wounds eventually plods through a wide variety of plot twists. All of this felt like much ado about little. Most of the shifts could be seen from a mile away, and none of them added much to the story. This remained a vengeance, solo mercenary fantasy, just like most of Seagal’s other films. It also suffers from some of the usual conventions. When we see Boyd make derogatory comments about his new chief toward a hot woman, it’s absolutely inevitable that she’ll be the official in question. Hasn’t this dude seen enough movies to know that’s always how it works? Wounds represents a veritable reunion of personnel from 2000’s Romeo Must Die. Again we find director Andrzej Bartkowiak plus performers such as Isaiah Washington, DMX, and Anthony Anderson. Unfortunately, Seagal’s a poor substitute for Jet Li. I didn’t much care for Romeo, but it seemed much superior to this work. Seagal started as a Clint Eastwood impersonator with karate moves, and that hasn’t changed over the years; to call his performance wooden would insult trees. Actually, Wounds does manifest a few decent moments. Despite its ludicrous payoff, the opening action sequence offers a fairly exciting piece, and a few other similar scenes work acceptably well. Unfortunately, these are too little, too infrequently, and we have to suffer through subplots such as Boyd’s “comedic” trips to a class for rageaholics. There he meets TV host Henry Wayne, which gives us the opportunity to see Tom Arnold at his most obnoxious. I don’t mind Arnold in the right role; he was fairly effective in True Lies. However, here he’s nothing other than grating and useless. Ultimately, Exit Wounds offers nothing more than yet another cookie-cutter action film. It vaguely strives to be different, but in the end it goes nowhere unique or special. A more solid lead or a more inventive director might have created a film that could rise above its origins, but in the hands of Seagal and Bartkowiak, Exit Wounds stands as a dud. 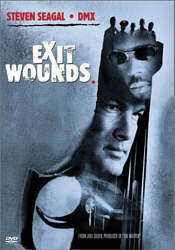 Exit Wounds appears in an aspect ratio of approximately 2.35:1 on this single-sided, dual-layered DVD; the image has been enhanced for 16X9 televisions. Although not among the absolute best pictures provided by Warner Bros., Wounds provided a generally strong presentation. Sharpness consistently appeared crisp and detailed. At no time did I discern any signs of softness or fuzziness, as the movie always came across as well-defined and accurate. Moiré effects and jagged edges showed no concerns, but some mild edge enhancement did mar the presentation at times. Print flaws were largely non-existent. I saw a speckle or two, but otherwise the movie seemed clean. Wounds went for a rather cool look, which meant that colors usually appeared desaturated. Nonetheless, they came across as accurate and distinct within those parameters. The hues rarely looked natural, but they weren’t supposed to generate that appearance, so I was satisfied with the bluish tint found during much of the movie. Black levels seemed to be deep and rich, while shadow detail was clear and appropriately opaque. Ultimately, except for a few specks and some edge enhancement, this was an excellent transfer. The Dolby Digital 5.1 soundtrack of Exit Wounds also functioned well, but a few minor concerns kept it from the top of the line. The soundfield offered a rich and varied experience that utilized all five channels nicely. The forward spectrum portrayed a broad and engaging realm in which sounds seemed to be cleanly localized and blended together clearly. The surrounds also added a fine level of reinforcement to the package, as they bolstered the action. Music came strongly from all five speakers, but the action sequences didn’t quite deliver the appropriate levels of chaos from all around the viewer. At times the rears seemed a little weak, though they generally supported the film well. Although audio quality was generally good, it showed some additional small concerns. Speech remained intelligible and clear throughout the film, but I thought dialogue often seemed to be somewhat thick and heavy; no edginess resulted, but the lines sounded less natural than I’d expect. Music was nicely robust and dynamic, but effects occasionally showed a surprisingly muted quality. The louder sequences didn’t always portray the appropriate levels of impact, as they were loud but not tremendously powerful. Much of the movie did deliver the expected bombast, but enough of the program appeared slightly subdued to knock down my rating to a “B+”. A sticker on the cover of Exit Wounds proclaims that it’s “loaded with extra features!” Perhaps my dictionary defines “loaded” differently than the one at Warner Bros., but if this is a loaded DVD, I’ll eat a bug. Wounds provides a few minor supplements, but these seem fairly insubstantial. Making Exit Wounds takes an 18-minute and 40-second look at the movie. It combines the usual mix of film clips, shots from the set, and interviews with participants. Oddly, we don’t hear from the director, but we do find producers Joel Silver and Dan Cracchiolo, actors Seagal, DMX, Michael Jai White, Jill Hennessy, Tom Arnold, Isaiah Washington, and Anthony Anderson, author John Westerman, fight choreographer Dion Lam, stunt coordinator R.A. Rondell, and police consultant Peter Weireter. Although the program sticks to a fairly promotional tone, it seems more interesting than most features in its genre. The examination of the action and fight scenes appear especially compelling, as they offer short but solid deconstructions of these segments. The spirit stays puffy and glib, but some of the information makes the program worth a look. Note, however, that the show gives away a few plot twists, so don’t watch it until you’ve seen the movie itself. A Day On the Set With Anthony Anderson shows us his workday through his eyes. The eight-minute and 50-second program follows Anderson as he goes through his work, and it can be mildly entertaining and informative. However, I must admit that I find Anderson to be a fairly grating and unfunny presence; if he were one-tenth as amusing as he seems to believe he is, he’d be the biggest comic genius to date. A music video for DMX’s No Sunshine shows the lack of inspiration we’ve come to expect from many rap artists as he grumbles on top of an old Bill Withers tune. The video mixes moody lip-synch performances with the usual movie clips and it seems dull. In addition to the movie’s trailer, we find Cast and Crew filmographies for Steven Seagal, Tom Arnold, DMX, Isaiah Washington, director Andrzej Bartkowiak; no biographical data appeared in those sections. While I don’t begrudge Steven Seagal’s renewed success, I must admit I wish I thought he earned this with a good movie. Unfortunately, Exit Wounds just looked like more of the same junk he peddled over the years, with the only added marketing twist coming from a starring role for a hot rapper. Wounds had a few good action pieces, but as a whole, it seemed predictable and inane. The DVD offered very good picture and sound plus a modest complement of extras. Fans of Seagal will probably enjoy this film, but others should continue their quest for solid action elsewhere; they’ll find nothing original or compelling about Exit Wounds.